On a hunt for a traditional Thanksgiving tuber, Katherine discovers what it takes to root your own sweet potatoes. 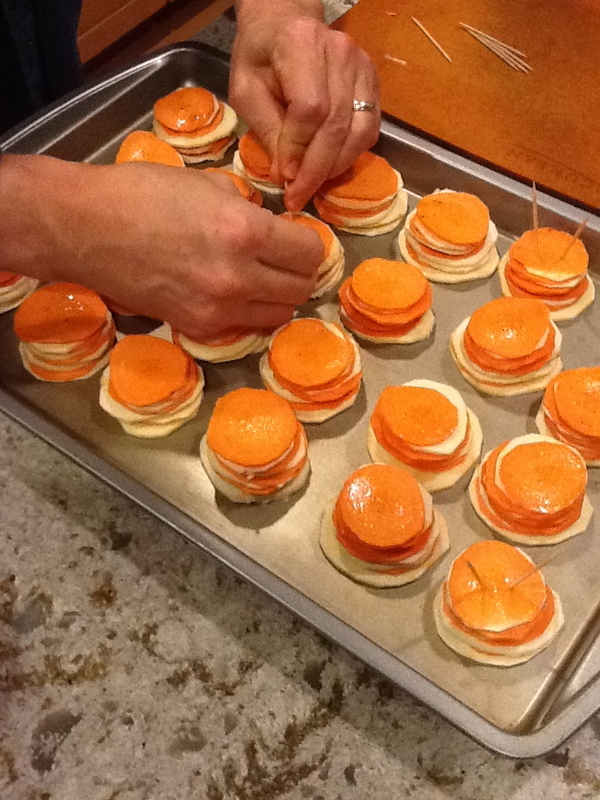 Here she explains how sweet potatoes are put together, which anyone can observe in the kitchen. 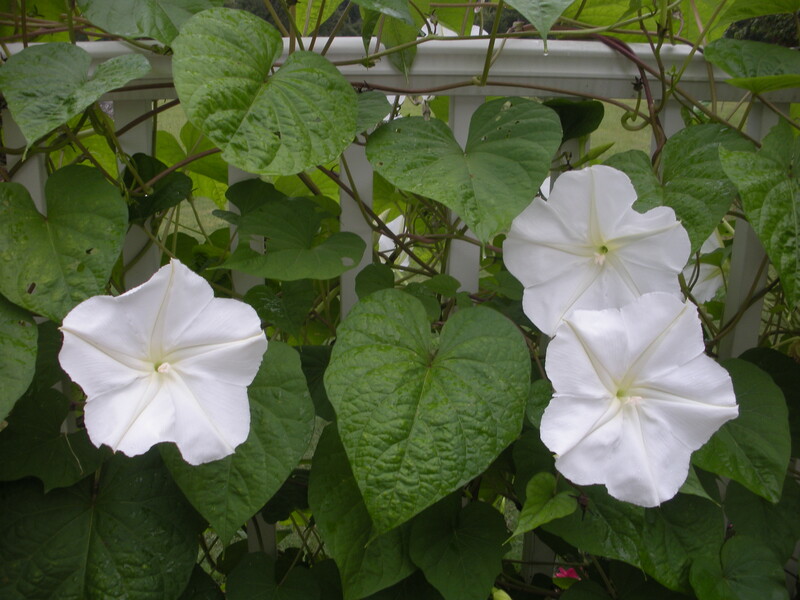 (Ipomoea alba), pictured here. I. batatas itself can be found in inky purple, green, and variegated ornamental varieties. We botanists can add a little something to the usual chef’s story by providing a phylogenetic tree illustrating the evolutionary relationship. Another interesting but little-noted distinction is that, as far as I know, sweet potatoes have absolutely nothing to do with either the spread of malaria or the evolution of sickle-cell anemia. A strong case has been made, however, that the cultivation of true Dioscorean yams in southern Nigeria over the last 2000 years opened up the forest and created the perfect standing-water habitat for malaria-carrying mosquitoes, which in turn favored the spread of the deadly genetic disease sickle cell anemia in the region because sickle cell carriers (heterozygotes) are immune to malaria (Durham 1983, 1991). If anyone at your Thanksgiving day table dares to call your sweet potatoes yams, you can probably silence them with this not-so cheery, but fascinating, story. 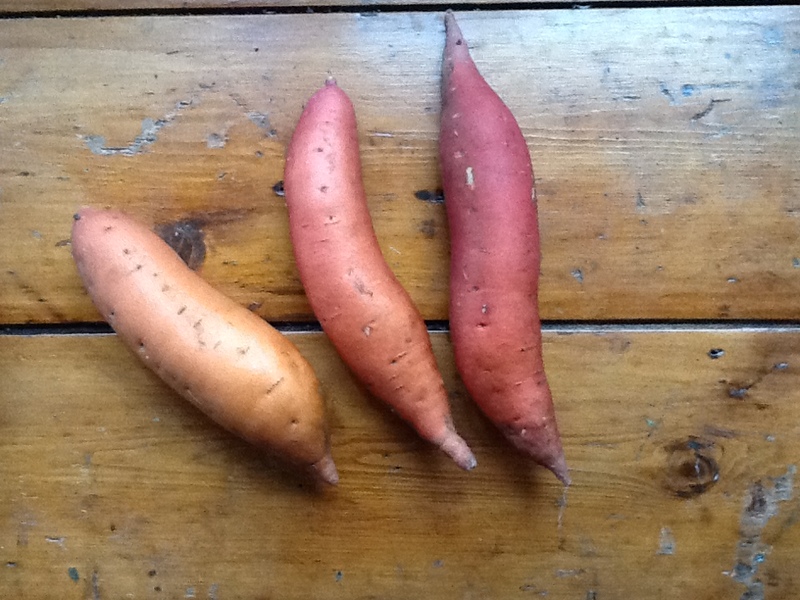 In addition to stumbling over the name, people sometimes confuse themselves about which plant part makes sweet potatoes. Sweet potatoes (and yams for that matter) are properly called root vegetables because they are root tubers. They are swollen storage structures derived from roots. By contrast, white potatoes (Solanum tuberosum) are stem tubers, and a topic for another post. Admittedly, sweet potatoes do not look like roots. They are not tap roots, fat at the top and tapering to the bottom like carrots, parsnips, beets, and turnips. It can even be difficult to tell which end of a sweet potato is the “top” because a sweet potato plant does not make one large main root but may develop several tubers from its lateral roots. Side roots often point towards the distal end of the tuber, the end growing away from the rest of the plant. At the other (proximal, or top) end, some individual tubers will have developed tiny buds. These buds will develop into “slips,” or new shoots, which Luis explained was the secret to cultivating sweet potatoes. The inside of a sweet potato is also worth investigating before you cook it. It is a storage organ, and like many other storage tissues, it is composed of large cells filled with sugars and starch. Orange varieties are also full of the pigment beta carotene, a precursor to vitamin A. A serving of less than 100 Kcals provides nearly a day’s worth of vitamin A and a good dose of several B vitamins to get you through the holiday stress. The fun part about raw sweet potatoes, though, is that you can squeeze milk from them. They are shot through with laticifers, basically long narrow cells full of milky sap called latex. This is the same kind of sap visible on the cut surface of a dandelion stem or a freshly cut head of lettuce. 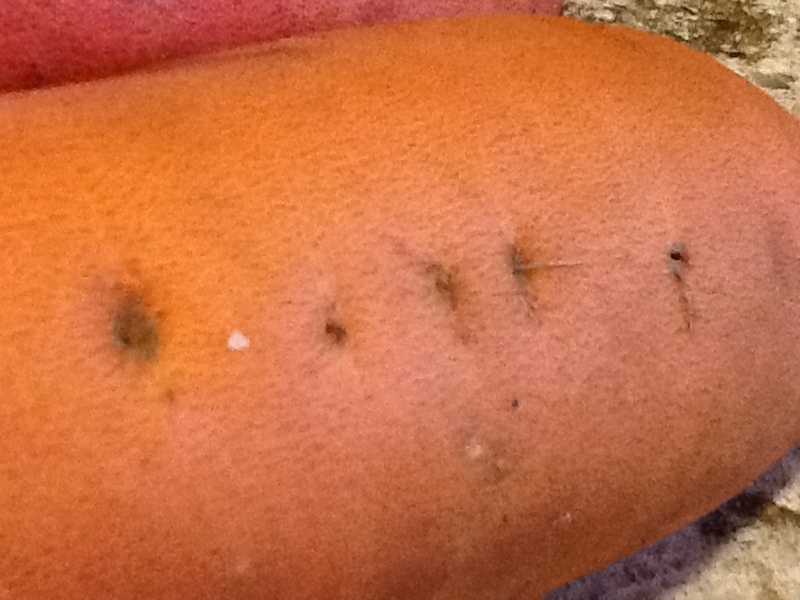 If you squeeze a sweet potato tuber right after slicing off an end, you will bring the sap to the surface. 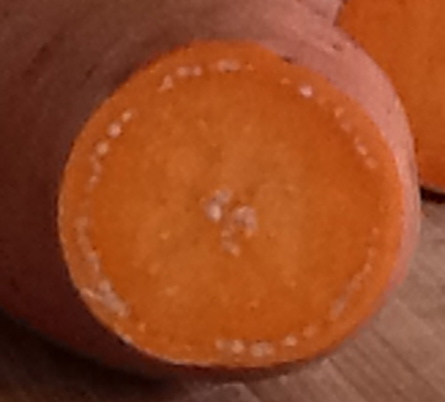 Squeezing a cut sweet potato brings white latex to the surface and shows where vascular tissue is located. Click to enlarge. Because these laticifers are associated with the vascular tissue (veins), they allow you to see that sweet potatoes develop randomly scattered clusters of veins, as well as a ring near the outside of the tuber and a large cluster in the center. The veins are also associated with fibers, which my grandmother used to remove from mashed sweet potatoes by beating them with a mixer. The fibers wrap themselves around the beaters, leaving behind a smooth fluffy puree. Luis was the one who told me about slips, the little shoots produced at the top of each tuber. What makes sweet potatoes a “long crop” is that they take several months to produce slips in the ground, which then must be divided, rooted, and replanted. As vines, they take up a lot of space on the ground for many months before harvest. No wonder many farmers don’t bother. I will definitely be rooting my own sweet potatoes this year, though. Following the collective wisdom of the internet, I will cut one of the tubers about one-third of the way from the top and suspend the cut end in water using toothpicks. 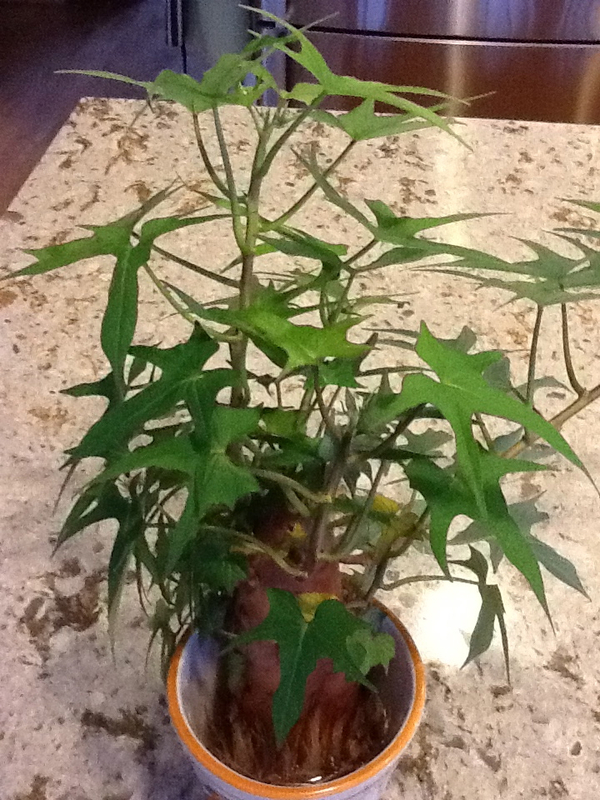 [Update: I will be following the advice of commenter Christina, who recommended using whole tubers, to avoid rot. She also notes that store-bought tubers are often treated to limit slips, so farmers market tubers may be more successful.] The bottom should develop roots while the slips grow out into viney shoots. Once they have developed several leaves, I will remove them from the tuber, place them in a vase, and allow them to develop their own roots. In the spring I should be able to plant them outside. Meanwhile, I will use the rest of the sweet potatoes to start my own new Thanksgiving tradition, stacks of alternating slices of sweet potatoes and parsnips, painted with browned sage butter, and baked until tender. Whatever you plan to do with your I. batatas this year, we at the Botanist in the Kitchen wish you a very happy Thanksgiving. 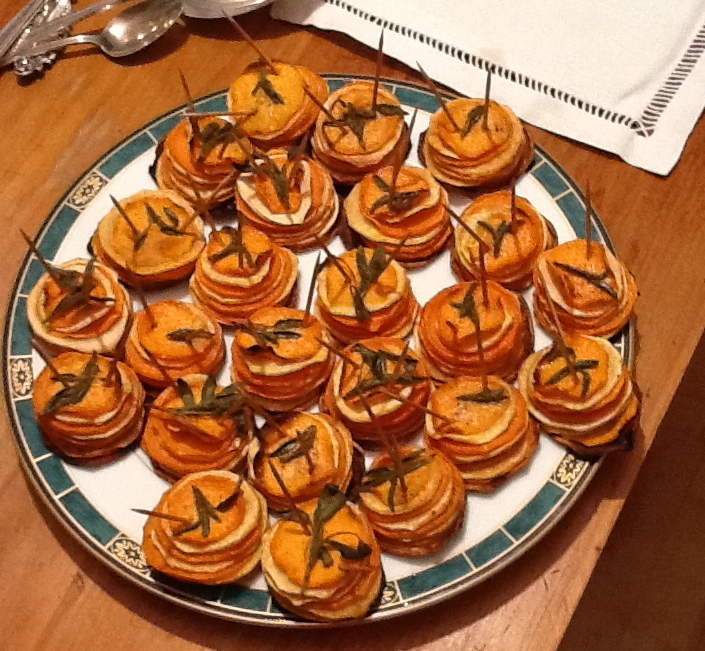 This entry was posted in Recipes and tagged Katherine Preston, morphology, phylogenetic relationships, potato, tuber, vegetable. Bookmark the permalink. Thanks, Rhizowen. 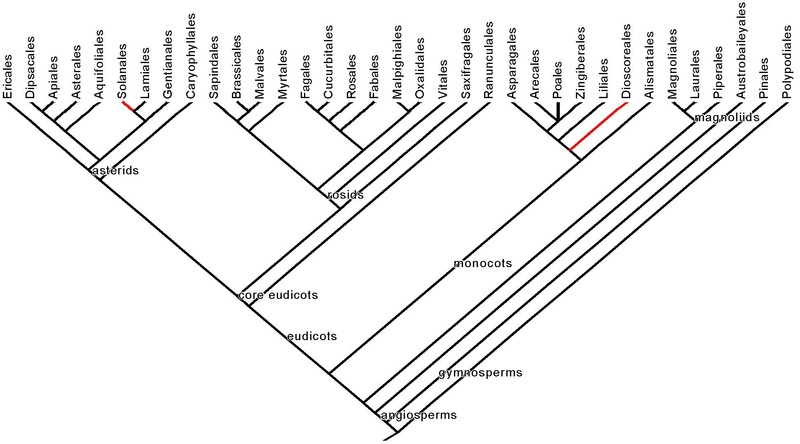 The N-fixing symbionts were news to me, but this seems to be an active area of research. It turns out that several different species of bacteria may form these associations. Very cool. Your site makes me think you might be able to answer this question: Do you happen to know what substance in raw parsnips makes them curdle butter? When they come into contact with the melted browned sage butter in my recipe they just seize it right up, whereas the sweet potatoes do not. Even room-temperature parsnips do this, so it’s not a matter of simply chilling the butter. Great post! That malaria nugget is fascinating. Man, I cannot get enough about the interaction between plants and people! 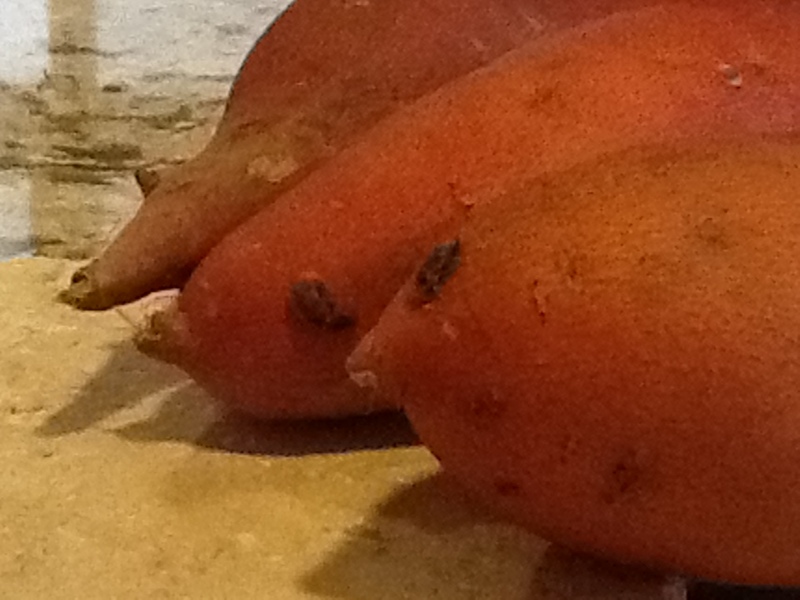 Sweet potatoes may be a long crop, but they are an easy, pest free crop, too. About starting slips: many grocery store sweep potatoes are treated so they won’t sprout. I recommend starting with stock you are very confident in. Also, cutting them encourages rot, so I have better luck sprouting slips on whole potatoes, just with the bottom quarter or so set in water. Some varieties (especially some purples) are very slow to sprout and are better sprouted in the soil. Have fun growing them next year–homegrown are definitely better. Thanks, Christina. I updated the post with your advice. Wish me luck. Good luck! You’re going to love them. Another thing that you may want to know, if you don’t already: after harvesting, you’ll want to cure the potatoes in a warm place for a couple of weeks to stop the milk, healing wounds and nicks, and sweeten them up. The curing really improves the flavor. I put them in a towel-lined box next to my husband’s gargantuan computer for ten days or so. Rhizowen’s comment about Nitrogen-fixing is fascinating–I didn’t know that! I have grown sweet potatoes from purchased slips for two years in containers on my hot asphalt driveway. The first year I harvested 24 lbs. from four totes! This year I only got 15lbs. which may have been because of a cooler spring or the new variety. The vines spread for many feet and are very attractive. I have read that the leaves are used as a green but I haven’t tried them yet. I also grew okra this year which isn’t often planted in New England. Some of the plants succumbed to a disease but the healthy plants gave us several delicious servings. Consider this a hint of a new subject for your wonderful blog. Okra is a terrific topic! It’s on the list. The unusual (and inconvenient) conditions needed to cure and store sweet potatoes (80 degrees F and 90% humidity for 10 days and then never below 50 degrees F) have made me curious about the biology of what is happening during that curing process. I assume it has something to do with them being a tropical plant. Any thoughts? Hi Amanda! It was so lovely to meet you in your beautiful garden at Riversdale. You’re right that sweet potatoes certainly don’t tolerate any cold and need to be harvested before or immediately after the first frost when grown in northern latitudes. The curing process seems to be all about turning starches into sugars. The tubers are still metabolically active. As soon as they are harvested they switch from storage mode into resprout mode and begin turning stored starches into sugars to fuel the new shoot. The tubers are edible immediately after harvest but become sweeter during this metabolic restructuring during curing. Thanks for this site! It’s really amazing how much there is to know about things we interact with so frequently–like sweet potatoes and pepper! I’d been curious about all the different kinds of the latter that are now available in the spice racks even at ordinary groceries in small Georgia cities like Macon. Something else I’m curious about is potatoes–used to be just baking and boiling varieties but now there are dozens of different kinds. What are the differences and how should be we using them? Purple, white, yellow, big, small, and NEW–why are new potatoes displayed over with the fresh veggies and not the potatoes and onions? Thanks, Nancy! You’re right that potato diversity is impressive but also a bit bewildering. We’ll certainly be spending quite a bit more time with the tuber in subsequent posts. For now, though, know that the ever-increasing diversity of potato types is just a small trickle coming up north from the literally thousands of varieties coming up from their native range in the Andes. Also, briefly, new potatoes are immature potaotes, usually harvested by hand earlier in the growing season without removing the aboveground portion of the plant, leaving it to grow more potatoes. New potatoes have thin skin and a particularly fine texture and are highly prized by some cooks. They don’t keep long, and their difficulty of harvest makes them more expensive, which is why they are stored with the fresh veg. Great post and excellent detail about the sweetpotato root structure. We folks in the sweetpotato research community continue to confused at identifying the “top” part of the sweetpotato storage root that do now emerged shoots or slips. A few quick notes about structure: the number of rows of lateral root scars visible on a storage root range from five to six. In a young adventitious root, there are typically 10-12 lateral roots per inch. The adventitious roots produced from a newly-planted slip or cutting comprise the bulk of future storage roots. The adventitious roots with the most number of lateral roots possess the greatest chances of becoming storage roots. There is some confusion about terminology, but a storage root develops from an adventitious root, not from a lateral root. Thanks! Thanks so much for the root anatomical details, Arthur. We really appreciate good info. And thanks so much for reading. Great very informative blog. I’ve only just come across it today….looks like Rhizowen’s been here first! Is it possible in your part of the US to take then over-winter stem cuttings in a sheltered spot, rather than start sweet potatoes from slips each year? I used to live in Papua New guinea and we had the most amazing fragrant sweet potatoes…flowery…not sure whether it was a taste or smell. Regarding yams, I used to live just below the yam belt in W Africa and remember the trucks laden with neatly stacked yams heading south to the coastal city. At the roadblocks these trucks were unofficially taxed 3 yams….which were enormous. Mind you, the largest ones, on show at farmers’ shows, much like our giant veggies traditionally are here in the UK. Thanks, Anne-marie. I’m not sure whether stem cuttings can be over-wintered, but probably in the SF Bay area of California, they could be. My own sprouted tuber is covered with healthy looking shoots, and I’ve just got it in a container of water in my east-facing window. I’m surprised it is not etiolated (leggy because of low light), but it’s not. I even have to give it about a liter of water a week. All this is to say that if you could get the cuttings to root early in winter, you could probably keep them going even inside all winter long. Thank you for this wonderful post! We found it while we were discussing sweet potato sprouting. You mention that slips only sprout from the proximal end, but in our farming experience we have seen sprouts forming from other areas on the sweet potato and also seem to find photos that show sprouts forming along the sweet potato (not just the proximal end). Can you please explain, in terms of root morphology, how stems might be sprouting from along a root? Thanks for your observations. My own sweet potato from last year is still going strong and it has continued to put out branches from slips that developed along the length of the tuber. The longest early slips were at the proximal end, and they spread distally, which is consistent with your experience. Have you seen the early ones starting in the middle? It certainly could happen, especially if the signal gradients (auxins, cytokinins) are somehow disrupted. As for how shoots can develop from a root, there are answers at several levels. Most generally, vascular plant roots have a layer of meristematic tissue associated with their vascular tissue that gives rise to lateral roots and sometimes to new shoots. The differentiation of new roots or shoots from this tissue is under complex hormonal control, and understanding this control is an active area of research. Some genetic studies investigate the basic details of regulation, while other studies seek to improve propagation of crop plants through the addition of various growth regulators. Species naturally vary a lot in their capacity and tendency to produce adventitious shoots, so the regulation must also involve species differences in gene regulation of signals and tissue response to signals. A quick search of Web of Science and PubMed revealed very little work on sweet potatoes specifically, but shoot production from the pericycle (a meristematic area of the root adjacent to the vascular tissue) seems to be stimulated by auxins. Thank you, Katherine! We also did a bit more research and found similar explanations. Also, on a bigger note, thank you for your blog. I’m an ethnobotany graduate student at UW-Madison and share your passion for learning about food botanically. I often share your posts and trees with students and colleagues, so it has been great to find your blog. Thank you, and have a happy Thanksgiving! Thanks for sharing the blog, Lauren. Have a great thanksgiving.